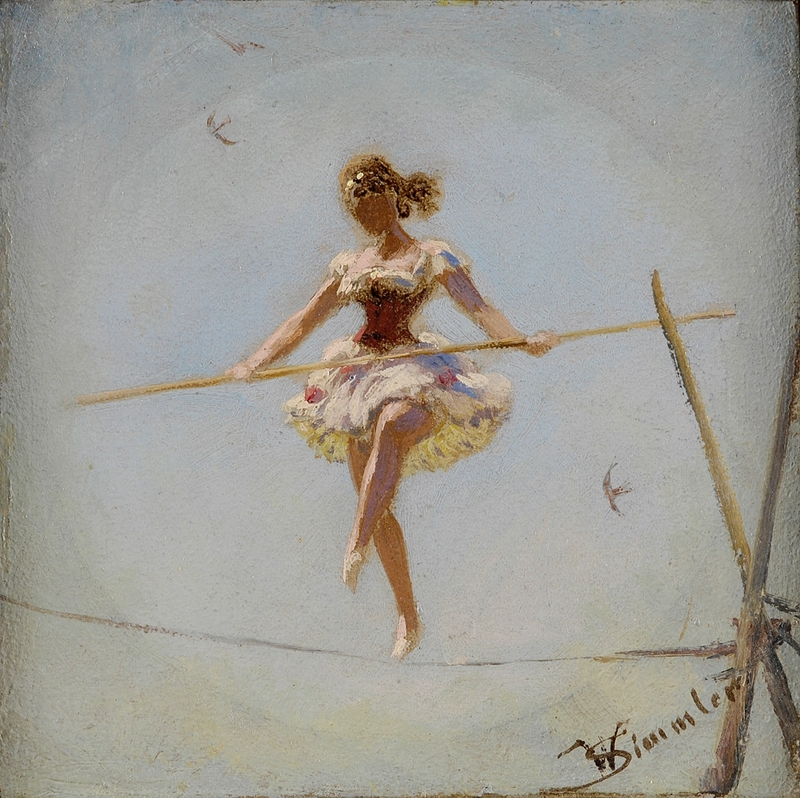 There are times when parenting seems to be nothing more than a big show of balancing acts. Balance between nurture and nature, between choice and obligation, between sweet, cuddling love and “This hurts me more than it hurts you” discipline. Balance between giving advice and sitting back and allowing natural consequences to take place. Between relying on your own generation’s trends and comfort zones and accepting that the one you are raising is likely going to chew them up and spit them back in your face. As our eldest son hurtles closer to tween-dom and teenager-hood, my husband and I continue to seek balance in the every day. One of the harder acts we’ve been faced with recently is finding the right spot to place our weight when it comes to living a life online. We are faltering a bit; trying to find the sweet spot between accepting that this age of electronic voyeurism and instant access is a valid part of his generations’ identity, and the desire to protect him from the very same thing. 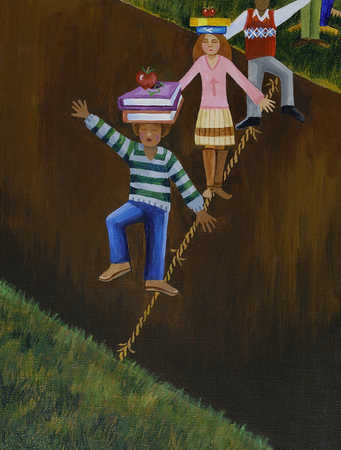 We struggle to find parity between the glut of information, the constant connection, the iUmbilicus if you will—the very things that make his generation stand out—and making sure that he is able to use, navigate, and assimilate that information wisely and responsibly. This is not the first time I’ve written about kids and technology. Like many parents, we set computer limits for our children. We want to protect them from the dangers and potential disaster of living a life onscreen, online, on demand. We want them to learn how to communicate in person, to nurture real life relationships, to enjoy the feel of sunlight on their skin instead of X-boxing their way through the dark cave of adolescence. But I’ve come to think that a lot of my own parental limitations are grounded in fear of the unknown. Our children are growing up in the Information Age. It is utterly, totally, and completely different from the way most of us were raised. It is not surprising if we are hesitant, cautiously embracing the new way of things, if we scoff at the notion. We may long for those nostalgic memories of dodge-ball and knocking on a neighbor’s door to play. But that is assuming that our way was better. And it may well have been. But to keep my children in the technological dark ages would not only be detrimental, but hypocritical in the extreme. I write a blog for heaven’s sake. I shop, read the news, pay my bills, and stay in touch over the computer. I frequently praise Google for it’s easy answers to sometimes laborious questions. I want my children to live a rich life, colored and textured and faceted with real life experiences. But perhaps I am deluding myself in my insistence on such strict limits and boundaries. Because the truth is, the internet has stopped being a tool to help us live our lives and has become the means by which people actually do the living. For the generation of young adults that are just now making their way into the world, iPhones are more than just a gadget. They are more than just a gimmick, more than just a device that lets you take arty pictures and play games. They are, quite simply, an extension of the person who holds them. A swipe of the keys, a flurry of thumbs; e-mailing, texting, booking, communicating, reading, researching. I am slightly horrified. But at the same time, I realize this is how young adults do things. Not just some things, but EVERYthings. They are siamese-twinned with iPhones and androids, conjoined with Instagram and Facebook and dirty switch-blade across the palm blood-brothered with a myriad of other Apps I’ve never heard of. And this is where I falter for a bit. Where I have to manipulate my balance stick in a ferocious twist to re-right myself before I tumble into some canyon of the unknown. When my son is required to have his own notebook for school next year, we will put on the nanny filters. We’ll talk about internet predators, educate him about scams, discuss cyber-bullying and all the other catch of the day phraseology. But how do you protect kids against stupidity and bad judgment? It is one thing to keep a diary under your bed with Mrs. Darcy scrawled in fancy font across the page, when the embarrassment of someone finding it is fairly limited. It is another when a bad decision or a joke made in poor taste goes terribly wrong and is there forever and always; accessible by not just a snooping little sister, but by the rest of the world. It was a long time ago that I was a teenager. But I remember the heaviness, the feeling that every decision was a Damoclean sword hanging above my head. But at the same time, not being able to truly look into the future, not having the experience, the relativity to understand how life is not in the moment, but made up of moments. And we have given a whole generation instant, constant access to the most powerful tool in recent memory. It’s a bit like giving the keys to your brand new car to your eight year old just because he used to drive his Cozy Coup around the park without incident. As much I may hate it, as much as we make off the grid time a priority, this generation of children, teens, and young adults won’t know a life without instantly accessible information. And I am not sure it is my place to invalidate the defining characteristic of a whole generation. But I worry. Or course I worry. Because with great power comes great responsibility. And responsibility is difficult to teach without experience. In order to foster responsibility we have to allow our children to make mistakes, to make their own way, to find their own counter-balance. It’s a lot of pole shifting, a lot of tiny steps and micro calibrations. The next few years will take a lot of reminding ourselves not to look down, where the unknown lurks, but to keep looking up in order to maintain that balance. It’s just that it was a whole lot easier to do when it wasn’t out there for the world to see. If It Weren't For Those Pesky Kids! Wonderful post (as usual) – love the illustrations! Thanks, DW! I got a bit caught up in Nik Wallenda’s Grand Canyon feat and originally this was called The Flying Wallendas. Changing the title was my very last edit, but it had to be done. 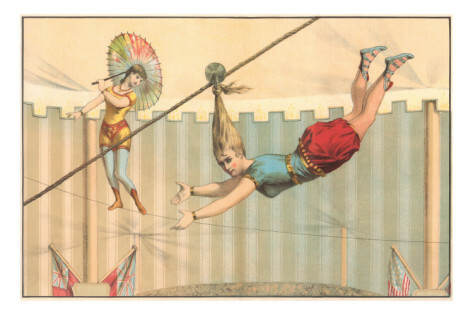 The whole idea of a tight rope/high wire balance act inspired looking for those lovely vintage illustrations. I agree with you, it is hard, the world has changed so much since I was a teenager…. It has completely transformed in fact and I don’t know how parents of teenagers cope. My teenagers have long since been transformed into parents of teenagers themselves and I consider we as parents got off lightly in the late 70’s and 80’s. They seem to have made it through with a bit of luck and a little guidance. That’s the struggle, Andra. To them, that is being in the moment. Personally I have a rather hard time with it, but again, my mother had a really hard time with MTv….I think that each generation has an identifying characteristic that the one before thinks will be their downfall…although this one may prove to be prophetic….but again, they said that about MTv too ;-). Aargh, indeed. But you must always stop for a hug, that’s the best part of being a parent. It makes up for all the other crap, like not being able to hear yourself think for huge stretches of time on end..